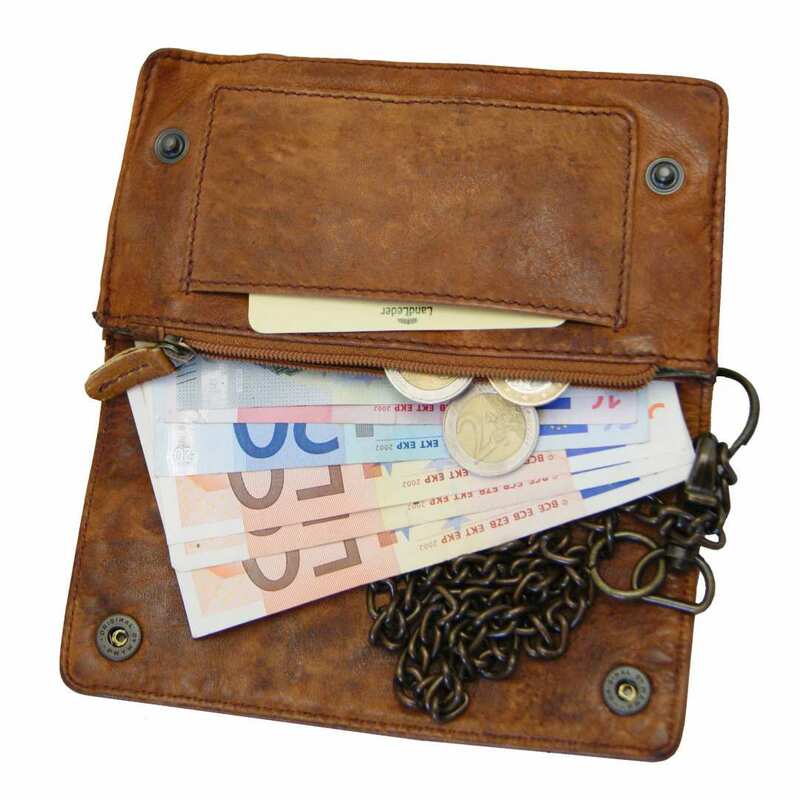 Product information "Men's chain wallet CARNEGIE of brown rugged-hide leather"
The men’s chain wallet CARNEGIE of brown rugged-hide leather offers you a safe storage place for your favorite payment methods and captivates you with its nice look. Transport your money well arranged and stylishly! A wallet is an accessory that should be optically attractive and functional at the same time. The men’s chain wallet of brown rugged-hide leather is faithful to these characteristics and therefore won’t deceive you! Its fine, striking as well as discreet surface helps you to look elegant both in the supermarket and at the restaurant. The many pockets for bills, cards and coins are especially practical and support you in keeping your finances comfortably arranged. Forget about losing your money purse! Are you always busy and on the go? Have you already had the unpleasant experience of losing your wallet? 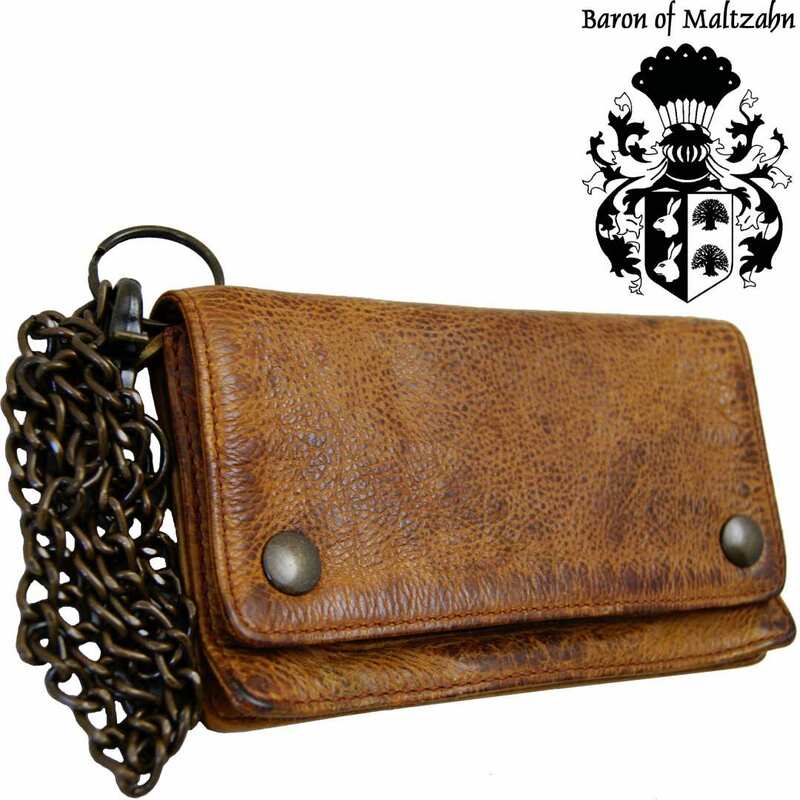 In this case, the chain wallet of rugged-hide leather is perfect for you! Thanks to its fantastic chain and hook, you will be able to easily attach the wallet to your jeans, jacket or briefcase. This way, you can have your money always at hand, even on the busiest and most stressful days. In case you are attending elegant events, you can detach the solid chain in one quick movement. 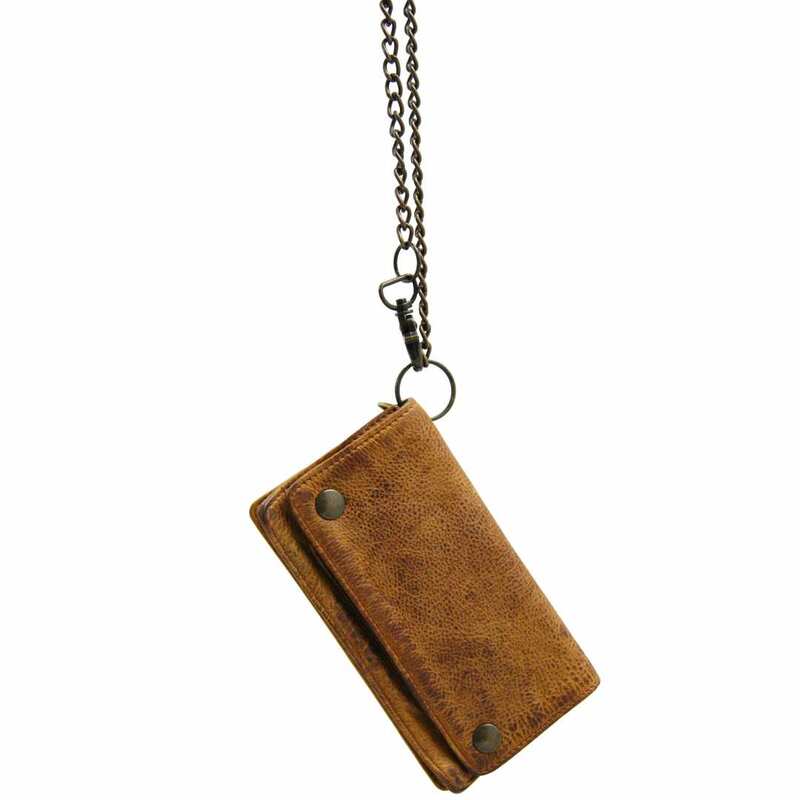 This leather accessory has the compact size of 6.7 x 3.9 in (17x10 cm). The wallet CARNEGIE consists of natural brown bovine leather which has been wax-rubbed by hand and then tumbled in a leather drum for two hours. 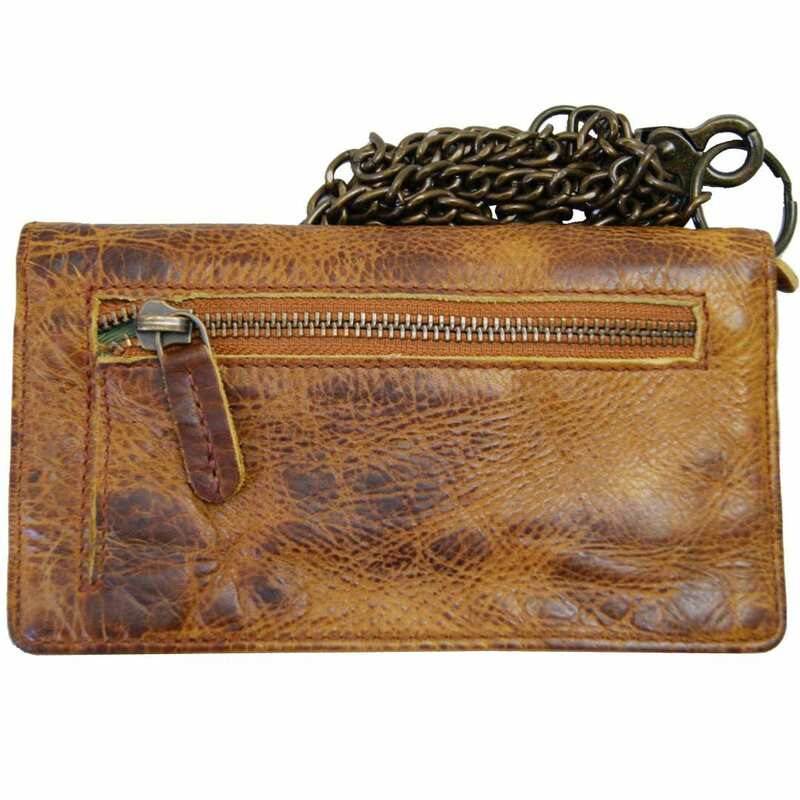 This way, the purse gets its fantastic ‘’old and used’’ look that makes this leather accessory really special. This procedure gives the leather the name ‘’rugged-hide’’. After processing the bovine leather, the inside of the wallet is provided with a soft protective lining. Furthermore, it also shows smooth running YKK zippers, metal snap buttons and a solid metal chain with aresistant hook. 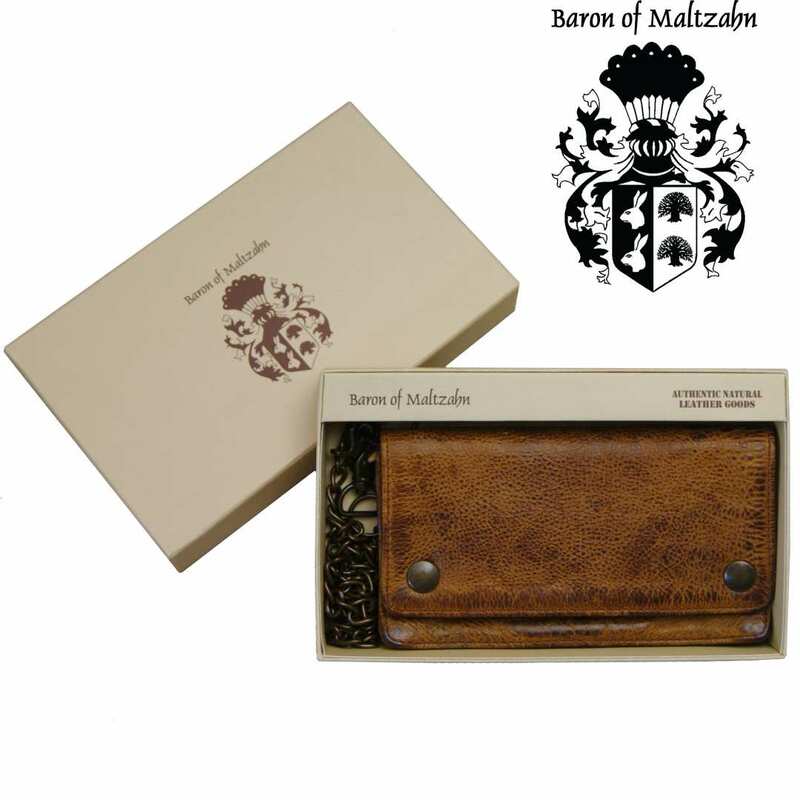 Remember that this is a singular piece of the fine Collection BARON of MALTZAHN. Why wait any longer? Order now and start enjoying the leather wallet! Reviews for "Men's chain wallet CARNEGIE of brown rugged-hide leather"